passed away on Friday April 12, 2019. The funeral will be from the Galante Funeral home 2800 Morris Ave. Union, N.J.
On Wednesday at 9 am. Entombment will follow in Holy Cross Cemetery in North Arlington. Visitation will be on Tuesday from 4 - 8 pm. at the time of his death he had been living in Lyndhurst 6 years. He was a Heavy Equipment Dispatcher for J.F. Lomma Inc in South Kearny for 20 years. and a former member of ILA Local 1478-2 in Newark. until she passed away in 2012. This year would have made 50 years of marriage. 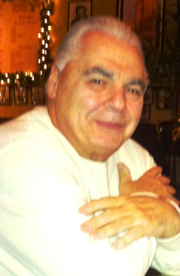 He is the father of Kimberly and Lisa Collucci and Nicole Albano and her husband Rocco. He was the loving grandfather of Jack, Nicholas, Sophia, and Rocco. and the brother of Angela Collucci, and the late Roxanne Esposito. He is also survived by many Uncles, Aunts, Nieces, Nephews, Cousins and Friends.